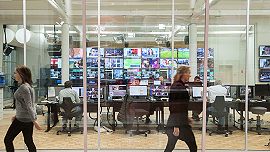 TV 2 Denmark signs contract for AVID news production system. Odense, September 2018: TV 2 DENMARK has signed a contract with Avid for a new production system supporting the digital transformation at TV 2 and focusing on cross-platform storytelling. Christian Rohde, Head of Production at TV 2 News and Current Affairs, said, "We’ve prepared for this thoroughly and a number of our key employees have helped defining and setting the standard for a new, modern, story-centric production system. The new system will help us ensure that all our stories are connected to one single point in the system no matter where we publish them and no matter who is working on the story. The new system also gives us new possibilities when it comes to working with multiple elements of the stories, e.g. text, video and graphics, and it will help us publish stories faster and easier – for the benefit of our viewers and online users." In addition to optimizing the production, the system will also improve the user experience for TV 2’s employees. Tom Bjerre, CIO at TV 2 Technology & IT, said, "This necessary replacement of our current production system, which is composed of many different systems, is a great opportunity for optimizing our production and pushing our digital transformation further. TV 2’s entire production team will be using the exact same platform across all our systems making it much easier to share materials and information. This will reduce the number of applications that each individual staff member needs to work with and the user experience will become more consistent, browser-based and mobile." According to schedule, the new production system will be ready during the spring of 2019 and the different parts of TV 2’s production will be moved to the new platform during the summer.